Solar power is the resultant conversion of sunlight into electric current via the use of solar photovoltaic (PV) panels. Additionally, it can be heat energy that’s generated from solar thermal systems which concentrate sunlight into receivers to heat water. Photovoltaic (PV) systems convert sunlight into electricity that can be used to power your home, office or industrial facility. Today’s solar electric technology can be harnessed to either supplement power supplied by your utility company or to take you completely off-grid from the utility company. Off-grid systems use battery back-up systems to store power. Solar water heating and solar electric (photovoltaic) systems receive solar energy in rectangular-shaped panels – also known as “collectors”. These solar collector panels are mounted on a building’s roof or ground-mounted in special situations. In solar water heating panels, water is heated by sun energy as it circulates through. 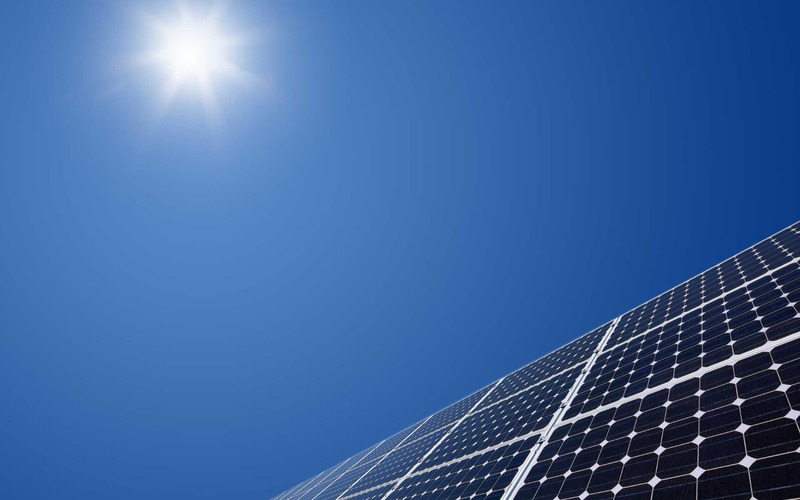 Solar electric panels contain the materials that convert sunlight directly into electricity. Solar panels are engineered to operate in very high winds and withstand environmental damages. Can solar energy lower my electric bill? Yes, Solar panels are used to convert the suns energy into electricity that can be used by your home or business. The hybrid solar systems are connected to the electrical system generally using solar power in day time and can give day time saving upto 85 % if properly designed. This allows your facility to utilize the electricity when it’s being produced by the sun to off set your usage from the Wapda. When the sun isn’t producing electricity in the evening, you use the power from the Wapda. The cost of a solar system depends on the size of the system that is built. Systems can be built so they are scalable. Each solar system will produce different amounts of power depending on how good the design is, what shading could reduce the systems daily production, and where the solar panels are on the earth. Each geographical region and even location is going to receive different amounts of sun. After all of this is calculated, then you can make an educated decision on what size of solar panel system you need and want based on your energy demands and budget. Solar panels life expectancy is more than 25 years. SK Solar City designed system requires less maintenance and service if the owner strictly follows guidelines. In most cases, these guidelines require owners to not adjust, maintain or repair the systems themselves. How do I get incentives from the government or utility company? Recently Prime Minister has given directions to put atleast all tube well on solar. You can view the most up-to-date information on the concern federal department. What happens if there is no sun that day? Lack of sunshine limits the solar energy potential of any solar energy system. However, some of the sun’s solar radiation will penetrate clouds to heat water or generate electricity. Will a solar panel get destroyed during a storm? SK Solar City ensures that all its solar panel systems to meet the required “wind load”. How long does it take to install a solar energy system? Most home systems can be installed by a SK Solar City team in 1 or 2 days. Installation follows a thorough site survey and engineering review. Larger commercial or business installations can take longer depending on size, complexity and special mounting. Does a solar panel need to be on my roof? For most home installations, the roof is the optimum placement for solar panels. It should be unobstructed by trees or other shade-producing structures, facing toward the south and able to be securely attached. If the homeowner has adequate yard space and/or many panels to be installed, SK Solar City can review the option of ground mounting. Do I have to angle solar panels at the sun all day long? Solar panels mostly are installed in a fixed arrangement. They typically don’t move to track the sun during its movement through the sky. Mounting the panels to face south at the proper angles enables them to capture and collect the maximum amount of solar energy during the day. The average PV module produces about 240 watts of power. However depending on the type of panel and manufacturer, a single panel is capable of producing up to 345 watts of power. How many modules/panels will my home or business need? This depends on several factors. It isn’t quite as simple as taking the figures above along with your power bill. Here are just a few of the questions we would discuss with you in person. Is this for your home, business or government project? What percentage of your electrical bill do you wish to cover? What is the amount of your monthly bills in financial terms? What is your monthly kilowatt usage for the previous 12 months? When are your peak electrical needs? What creates the major electrical “draws” on your site? Do you have an overall budget in mind? Will you be installing other forms of renewable energy production? Depending on your answers to questions like those listed above and others we would ask you in person, we’ll be able to tell you how many panels your project will require. We can give you a range of choices to meet your specific needs. That depends on the type and size of the system you install. Grid-tied PV systems meet a percentage of the home or building’s electrical needs. These systems are not meant to handle the entire electrical load usually because the up-front costs are too high. Provided you have the space, absolutely. PV systems are made to easily expand. How soon will I realize a return on my investment (ROI)? Most commercial/industrial projects should see a ROI in 5-10 years or less. Residential projects may note their ROI in 5-20 years depending on size and usage of energy. No, weather should not be a concern for you. Why? These panels are made with tempered glass and rigorously tested to ensure a long life. They are even hail-tested. In the rare situation where you experience a rare weather or environmental event, your homeowners insurance should cover replacement. Be sure to double-check that your coverage handles all weather situations, including flood. The typical manufacturer warranty is 25 years. However, the average PV module may last up to 60 years. The rest of the system has a shorter warranty and life expectancy. Again, the panels generally have a 25-year warranty from the factory. The length of this warranty is longer than most items you could buy for your home. The remainder of your system’s warranty depends on the item. Remember, your entire solar panel system has no moving parts, and this is one of the reasons it lasts so long. I keep hearing about Net Metering* (or bi-directional). What is this? When your solar power system creates an excess of energy that your site cannot immediately use, you can “push” that energy back in to the main power grid of your electric company (if you are grid-tied) and use it later during the night or on a cloudy day. It has not yet started in our country. Will I need to install a special new meter? Yes, here in Georgia, you will need to have a second meter installed. This installation will be a part of your overall solar installation and will be handled by properly trained technicians. Besides peace of mind, the savings on my utility bill, and the generous tax savings, are there any other benefits to installing renewable energy? Yes, installing any kind of renewable energy system to your property will increase its appraised value, too! What are all the benefits of having a PV system installed? Lower or eliminate your energy bill from your utility company by utilizing “free” energy from the sun, instead. Not everyone can afford to install a full PV array system that will completely offset their home or business’ utility costs. However, even a small system translates in to savings on your bill. This savings keeps on going and more than pays for your installed system in a few years. Arrays installed on your roof act as a shade for your roof because most of the sun’s energy is reflected away from your home/building. This reduces the amount of radient heat that is absorbed and translates to your air conditioning system working less in order to maintain interior comfort. So if you have a grid-tied PV system, you will use less from your utility company, as a result. Furthermore, you can install arrays in such a way to create new shade in areas where you don’t currently have them. For example, create shade for parking your car(s), or use them to shade your patio, deck or balcony seating. There are a myriad of ways you can install PV arrays that blend in with the building or landscape, or you can make them stand-out for an artistic or utilitarian effect. You may receive state and/or federal tax incentives. Depending on certain factors, this could reduce the time to experiencing the return on your investment, considerably. Excess energy created by your system can be pushed back to the grid (a la “net metering”) and reduce your bill, or it can sold back to us. In this case, you would receive a check for that amount. Your system helps the environment by reducing your carbon footprint, now, and for years to come. This translates to cleaner air, a slowing of global warming, and less acid rain. Every eco-system benefits. In addition, you reduce the amount of noise pollution in the environment as a whole because your system is completely quiet. If you install a UPS along with your PV system, you can be assured of having electricity at all times, even during “local” power outages. As noted in the previous question, your property value will increase. You get peace of mind. Your decision helps you financially and impacts the world for generations to come. Depending on the percentage of your bill you choose to eliminate with a renewable energy installation, you are shielded by the same percentage from fossil-fuel-driven utility company rate hikes in the future.